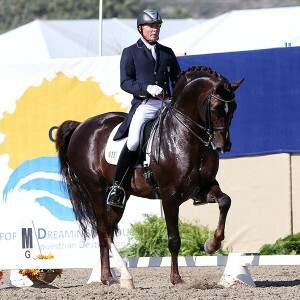 DEL MAR, California, April 25, 2015–Jan Ebeling and FRH Rassolini posted their first victory when the pair won the Del Mar National World Cup Grand Prix Freestyle Saturday night and plans to head to Europe to train and compete over the summer. Jan of Moorpark, California and the 12-year-old Hanoverian stallion were awarded 71.500 per cent for the win over Kimberly McGrath of Redlands, California on Winslow second on 69.550 per cent and Michelle Reilly of Encinitas, California on Umeeko third on 68.625 per cent. The Freestyle was the first North American League qualifier for the World Cup Final in Gothenburg in 2016. Rassolini is a successor to Rafalca, the mare that Jan rode on the United States team at the Olympics in London in 2012 in the heat of the American presidential election campaign in which the Republican candidate was Mitt Romney whose wife Ann was an owner along with Beth Meyer and Amy Ebeling, known as the “Three Amigos.” Coverage of Jan and Rafalca put dressage on television from prime time newscasts to late night comedy shows as well as extensive reports in mainstream newspapers and magazines around the world. Rafalca, now 18 years old, is living in semi-retirement at the Ebelings Southern California equestrian center. Rassolini (Rubioso N x Silvano) was the 2010 champion of Germany’s most prestigious small tour championship, Nürnberger Burg Pokal, and had been started at Grand Prix when bought by a syndicate of 10 Americans put together by the Three Amigos. Jan plans to take Rassolini back to Germany to work with Hans-Heinrich Meyer zu Strohen, the German Junior and Young Rider coach, whose wife Kathrin competed the stallion until bought as a potential team championship mount for the United States. Rssolini made his international Grand Prix debut with Jan just over a year ago and since then has logged seven top five finishes in 12 starts, all in California. Breitan, a Breitling Hanoverian bought as a youngster by the Three Amigos and now 10 years old, will go with Jan to Germany. Described as a “late bloomer,” Jan has competed Breitan up to Intermediate 2 in national classes and believes he is an exciting prospect. “I’m very lucky to have two horses that are top notch international caliber,” he said. Their son, Ben, is a devoted and successful jumper rider. “It’s couldn’t be better. We do what we love and the whole family is into it.